So, the clock is ticking and one day, you just wake up, your child is growing up and you think it’s time for her to switch into her own room. Oh how time flies! Your fragile little one is now a toddler which means, how to get her sleep in her own bed will be a challenge for sure. While you opt to help getting your toddler to sleep in own bed, understand that lots of children struggle adjusting from the comfort of sleeping with their parents to sleeping in their own beds. Of course, this is just another phase in toddlerhood that you have to deal with no matter how difficult it could be. Toddlers have been very dependent on the presence of their parents at bedtime during their first years. Most likely in sleeping, your young child cannot be easily taken away from you. In the training process of getting her sleep in her own bed, be patient and anticipate that before things will get better, they will get worse. There will be sleepless nights again, lots of crying and begging, and bargaining. But always remember to be firm with your decision in times like these. Your goal is to get her sleep in her own bed and that will be very gratifying once you successfully teach her to be independent at nighttime. 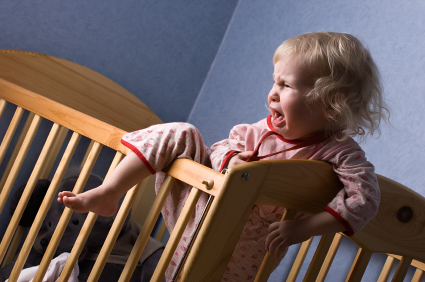 In addition, your toddler can be easily disoriented with her sleep routine. Establishing a consistent naptime and bedtime habit for your child may help aid this as small changes may ‘deregulate’ them. In cases like when your child had a nightmare or became sick, it would be hard to get her back on your established sleep rules because of her frustration. You are exhausted and all those stuff start to become worse. Now is not the time to give in. Things may not get worse all the time, some experience it better especially when you take the transition not too slow nor too fast—choose the proper timing that will suit your child’s behavior and preparedness. Your task may not be that easy to accomplish but try to extend a little bit more patience. Parenting might be the toughest job but the most fulfilling one indeed. Keep in mind these following tips in helping get your toddler to sleep in her own bed. You may offer empathy without compromising the needs to imply your regulations. Understand her thoughts and make her understand your points as well. Repetitive conversations may help her better understand the phase she is going through. Just be clear when communicating so that your child won’t be confused. Provide her the attention she seeks for during the day. At night, show her comfort and affection by staying with her until she falls asleep. Your child may feel better if you offer rewards. Try using the chart system. Timing has always been very necessary in parenting and you know that! Keeping the lights on may help relieve your child from worries at night. This will give him security and added comfort. Story telling is an activity that calms a child. Choose stories that have moral lessons as well. Giving him a warm bath and making him drink a glass of warm milk before hitting the sack will help relax your toddler. This will make easier for you to get him to sleep.